Charity Dinner on behalf of The Back-Up Trust held at the Sheraton Grand Hotel, Edinburgh. 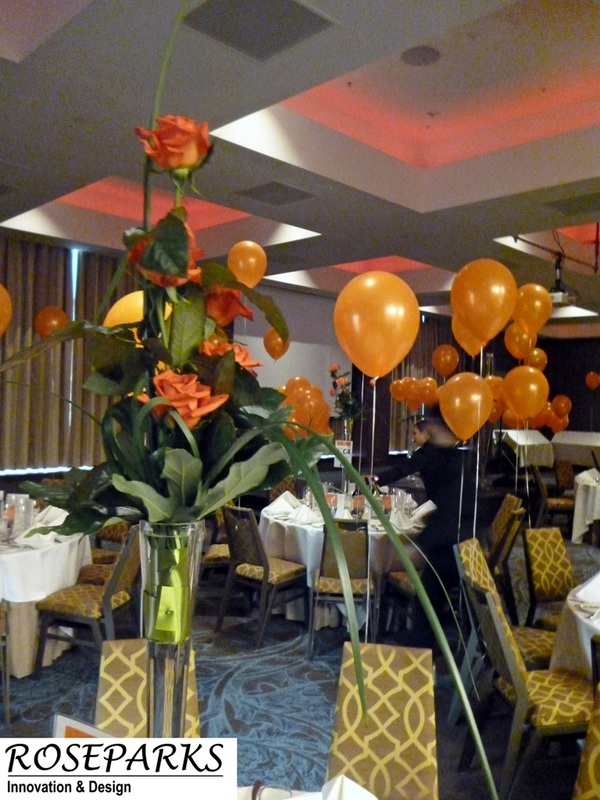 We were delighted to be able to provide table centres for this charity dinner. At Back Up we know a spinal cord injury can be devastating, but we believe that it shouldn’t prevent anyone from getting the most out of life. Back Up is for everyone affected by spinal cord injury, regardless of age, level of injury, or background. We are here for family members too. Our services include mentoring, wheelchair skills training and activity courses as well as support in getting back to work or school after an injury. All our services help to build confidence and independence. We help you get your life back and achieve your goals – whether these are about family, work, lifestyle, social life, travel, or simply to feel positive about the future. Table Arrangements: Tall skinny flute vases topped with spring flowers and greenery with trailing ivy and jasmine. Action Medical Research for children, held their annual spring lunch at The Sheraton Grand Hotel & Spa on Friday 4th March. “Action Medical Research for children, for life.” The charity saving and changing children’s lives. AMR hold many fundraising events throughout the year including cycling, trekking, running, walks and team challenges. Visit their website for further details – Action Medical Research. We were delighted to provide table arrangements once again this year for their annual spring lunch. Nicola & Mark chose the Sheraton Grand Hotel & Spa for their wedding venue. Nicola carried a hand tie of crystal blush calla lilies, white roses and spray roses. Nicola’s bridesmaid held a hand tie of calla lilies on their stems and the flower girl a baby version of the bride’s. The reception table arrangements were tall lily vases topped with white calla lilies and arillia leaves with grasses sitting on a round mirror and surrounded by little pots of white roses and tea lights. Faye & Dean chose the the luxurious Sheraton Grand Hotel & Spa for their wedding venue. For the ceremony Faye carried a hand tie of white/green freesia with white phelanopsis orchids and hydrangea. The flower girl held a baby version of similar flowers. For the evening tables Faye & Dean chose tall martini style vases filled with a full, lush arrangement of white freesia, calla lilies with a few orchids and greenery. The top table had a similar theme in baby martini vases. Our very best wishes to Mr & Mrs Davidson who held their Golden Wedding celebration at the Sheraton Grand Hotel & Spa. Mr & Mrs Davidson’s guest tables were decorated with low bowls of summer arrangements of soft pink hydrangea, sweet avalanche and white avalanche roses, with white and lilac eustoma. The foyer was decorated with baby versions of a similar theme. “Thank you for the beautiful floral display you provided for our Golden Wedding celebration. We were really thrilled when we saw them and so many of our guests remarked on the subtlety and perfection of the arrangements. I absolutely loved the delicacy of the shades you used and we were so pleased we took your expert advice. Charity event at The Sheraton Grand Hotel & Spa on behalf of the Marie Curie Hospice in Edinburgh. Roseparks are proud to sponsor this event again for the fourth year running. A very worthy cause indeed. For more information on this charity please follow this link. “Thank you so much for supplying the most beautiful flowers at our Fashion Show. They really set the room off and looked just fabulous. We really appreciate your support.” – Fiona Bushby.